Our customer Alfredo from San Antonio has done a lot of research into the process of applying for recreational equipment benefits through the Veterans Administration. You can see the full text of his presentation that he’s done at adaptive sports clinics around the country here. Technically, what you’d get from the VA is a “benefit” and not a “grant,” and he’s been called on the distinction. But they just don’t teach you those kinds of details in paratrooper school. Veterans Health Administration (VHA) Directive 1172.05, dated February 1, 2017 Recreational and Sports Equipment. – The prescribed equipment must be of a nature that specifically compensates for their loss of use and is designed for individuals with physical disabilities. (My notes: The equipment must compensate the veteran. It will be different for everyone becuase of their disability). Recreational Sports Equipment may be issued to those Veterans who are seeking to enhance their health and attain higher rehabilitative goals through recreational sports activities. Section IV has 5 paragraphs. I will only discuss paragraph D Recreational Sports Equipment (Non-Motorized/Power). Devices specifically designed for use by individuals with disabilities that do not entail motorization may be provided. These include sports wheelchairs, sport devices, hand cycles and prosthetic devices. 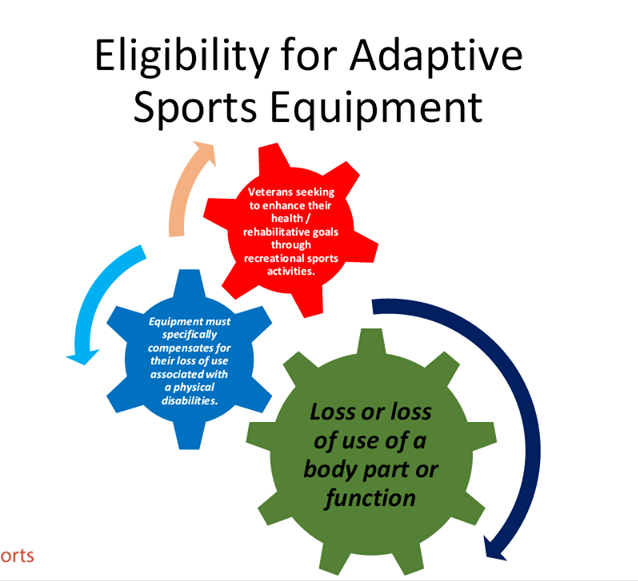 While standard (non-adaptive) products are not provided, modification, adaptation and customization of standard product may be provided to allow the individual to use the equipment. An example is a standard bicycle will not be purchased, but a modified handgrip and gear shifter may be provided to allow a veteran with an upper extremity amputation and prosthetic device to operate the bicycle safely. My Notes: The VA will only buy adaptive bikes. NO standard bikes but will provide prosethics and adaptation to ride safely on a standard bike. ** Electric assist is not an option for requesting through paragraph D Recreational Sports Equipment (Non-Motorized/Power). It is a electric motor, it can be possible but will explain over the phone or in person. Each veteran can follow page 9-11 and check off the requirements to request adaptive recreational sports equipment grant before they see their Primary care and submit their VA firm 10-2641 with supporting documents from the required checklist.